Stops lips from drying out, leaving them feeling supple and soft. Protects from the cold, and provides sun protection without chemical sunscreens. 100% natural origin. Non-toxic to coral reefs and the marine environment. To use: Apply to lips as often as needed. Reapply frequently to maintain sun protection. Ricinus communis seed oil (castor), Cera alba (beeswax), Dicaprylyl carbonate, Zinc oxide, Sesamum indicum seed oil* (sesame), Titanium dioxide, C10-18 triglycerides, Butyrospermum parkii butter* (shea), Cocoglycerides, Macadamia ternifolia seed oil* (macadamia), Helianthus annuus seed oil* (sunflower), Copernica cerifera cera* (carnauba), Polyglyceryl-3 diisostearate, Polyglyceryl-2 dipolyhydroxystearate, Caprylic/Capric triglyceride, Aloe barbadensis leaf extract* (aloe vera), Hydrogenated castor oil, Aluminium hydroxide, Stearic acid, Parfum, Tocopherol. Due to the inclusion of beeswax, this lip balm is not suitable for vegans. 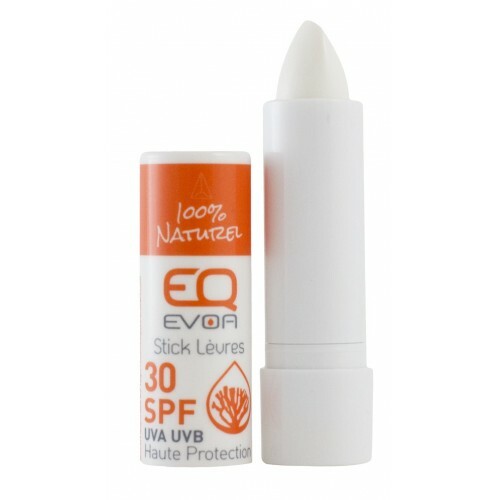 EQ EVOA: The first sunscreen certified as non-toxic to coral reefs and the marine environment. Free from parabens, phenoxyethanol, chemical filter, nano-particle and PEG.